When you look at Aston Villa’s transfer spend for the summer of 2013, according to the tables published by Sporting Intelligence, it’s roughly the same as the £20 million outlay Lambert spent last summer. 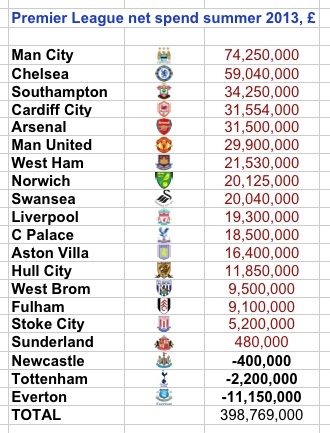 In terms of Villa’s acquisitions this summer and how they relate compared to other Premiership clubs in the tables below, the players transfer values are based on the following transfer prices (calculated by Sporting Intelligence). I certainly think you can shave £2 million off the Kozák price. Also, Steer wasn’t a free signing, with his transfer fee going to a tribunal. * – According to Sporting Intelligence. Some are obviously estimates. The outgoings from Villa Park that actually commanded a transfer fee are Barry Bannan to Palace for £1 million and Jean Makoun at £2.6 million to Rennes (amounts by SI). 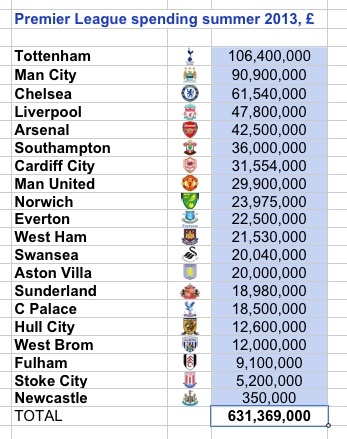 In the Sporting Intelligence tables below, they seem to have neglected loans from their figures. So, in Villa’s case, the estimated £2 million loan fee Villa received from Fulham for Darren Bent is not factored into the net Aston Villa transfer spend figure. If you take say two million off the projected Kozák price, then Villa place 15th in the spending table. Considering the team finished 15th in the league last season, cynics will say Villa haven’t actually spent with a view to climbing the table this year. Of course, this is a very simplistic viewpoint. Lambert’s insightful and astute value purchases can’t be quantified in purely monetary terms. For example, Benteke’s £6 million transfer fee is miles away from his value now. That fact that he signed a new contract too is a akin to signing at least a £25 million valued forward. Also, the young team has a year of vital Premiership experience now, which, as we’ve already seen from the first three games, has toughened them up considerably. Even when you factor in that extra £2 million Villa didn’t pay for Kozák and a further £2 million loan fee we got back from Bent, the club would still would be pretty much in the same position in the above net table. But with just over a net spend of £12 million, it shows Villa to be a tightly run club, considering the increased TV money they received. Villa could have easily spent more on players, yet restraint has been clearly exercised. In terms of player wages, the club is almost where it wants to be, with really just the reckless contracts given to Given and Hutton an issue now. With Bent and Ireland off the wage bill though, it means that the Villa manager won’t have the spending shackles on now. Although, spending big has never been Lambert’s ethos. Away from Villa, the most interesting factors of the last table are firstly the three teams that have actually made money this transfer window; two of them due to last-minute inflated-price selling of their best players. In Spur’s case, the sale of Bale has facilitated a rebuilding of their team. It will take time to gel, but they’ll also have more cash in the kitty to strengthen further. Everton’s sale of Fellaini and also Anichebe (getting £6 million out of the Baggies is one of the best bits of business of the window), with Kone, Barry (loan), Lukaku (loan) and McCarthy coming in, also poses an interesting question to whether the team has managed to improve and also make money? Contrast that with the likes of Chelsea and Manchester City spending big, yet again, and you’re made to wonder whether these ‘Fair Play Rules’ could ever hold back the ‘Top Four’? JoeLarner MyOldManSaid The problem is other teams are stronger now – like Spurs, City, Liverpool – so it was easier to finish 6th, when Villa shelled out on wages under O’Neill. So many permutations and factors, with all these things. A similar article looking at wages would be a good read. Team performance is far more closely correlated to wage spend than to transfer spend, and Villa’s wage bill has been slashed drastically over the past few years. It would be interesting to see if our league position has dropped faster or slower than should be expected. JoeLarner I think you’re nit picking a little bit mate. The tables are someone else’s tables (not created by us). The mention of the Kozák price is because it’s been reported to be different amounts depending on where you look (I don’t believe it to be £7 million). I don’t care how much £7 mil is in Euros tbh, as I’m more shaving off £2 mil for arguments sake. If I didn’t mention it, I’d have had several people commenting Kozák wasn’t signed for £7 million! I mention it and also researched and displayed the transfer values Sporting Intel attributed to Villa players, as I was surprised by their £20 mil figure. The mention of the Bent fee is to also further highlight these tables are not exact science (PS – from what’s been widely reported, Fulham paid both a fee & his full wages for the loan). The Benteke mention is just an example to show, that just because we’re 15th in the spending table,it means that’s where we should expect to finish, as transfer prices shouldn’t be taken literally. 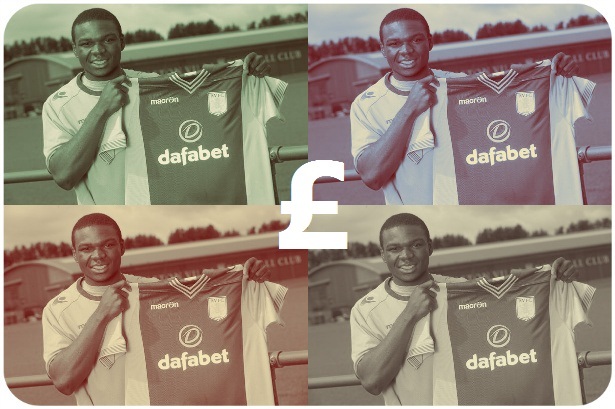 As the two Benteke examples of increase in value and what it would cost to buy him now show. So, we’re just pointing out a couple of things about the tables from a Villa supporter POV. These points/figures are not adjusted on the table, so why go to the trouble of changing the other teams?! In terms of the ‘Financial Fair Play’ reference, that had quote marks to denote ironic emphasis. Of course, I know they have bigger revenue streams etc, but it was more a pointed remark at the notion of this situation being ‘Fair’ in any shape or form! This Sporting Intelligence report is not an exact science, as it would be impossible to obtain exact transfer figures from clubs, but it is an interesting ball park study. Interesting subject matter for an article, but a lot of misinformation. For a start, 7 million euros is a lot closer to £6m than £5m. Regardless, you can’t use one source (Sporting Intelligence) for the whole league, and then adjust their figures for what you think Villa really paid/received without doing the same for every other team. You can’t say Benteke was £6m last summer but is worth more now, AND we signed a £25m striker this summer – you can say we got a world class striker on the cheap last summer OR this summer, but not both. Are Fulham really paying all of Bent’s wages (£3m) in addition to a £2m loan fee? If that’s true, they’re paying £5m to get Darren Bent for one year. I’m not saying you’re wrong about this, I just think it’s very bad business for Fulham. And as for Financial Fair Play, everyone seems to forget that it restricts clubs to paying only what they can afford. Of course the top four can afford to spend more, they have far greater revenue streams. FFP will maintain the status quo. Normally great articles on MOMS, but this one was a bit of a shocker.